Have you been searching everywhere for Softish Throat Drops™ by Pine Bros.? If so, then you are in for a treat because they have just reintroduced their line of Softish Throat Drops™ based on popular request by their customers. What makes these Softish Throat Drops™ so special? Unlike hard throat drops, these are “softish” with a firm, gummy-like texture that is very soothing to the throat. The Wild Cherry and soothing Honey flavors are all naturally flavored and delicious. I also appreciate that the Wild Cherry has a lovely red color that comes not from artificial flavors but instead with Elderberry concentrate. I really like the unique consistency and plan to stock up on these throat lozenges for my father who will soon be undergoing radiation for throat cancer. 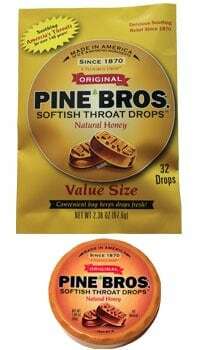 You can purchase Pine Bros. throat drops online or at local retailers like CVS. You are also invited to visit the Pine Bros. website to learn more about this reintroduced throat drop!